The powerful wide-angle view with zoom shows you what's happening at home in 720p high definition - so there's no pan-and- tilt needed. With 24/7 Live Video mode, smart mobile alerts, 256-Bit encryption and it adapts to your location or use with home & away modes. Set up your own special alert zones to monitor sensitive areas - while ignoring background motion like ceiling fans to avoid false alerts. No matter where you are, stay in touch with family members - and those mischievous pets - with the handy two-way audio function. 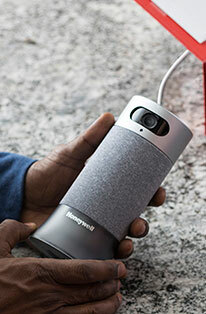 The Honeywell Lyric C1 Indoor Wi-Fi Security Camera combines a series of industry defining technologies to deliver superior interior surveillance. Audio and visual protection is assured as this camera includes Intelligent Sound Detection. 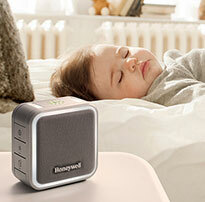 The inclusion of this feature allows the Honeywell Wi-Fi Camera to identify specific sounds around the household such as smoke or carbon monoxide alarms triggering. Should the Honeywell Security Camera recognize a sound detrimental to the home's surrounding area, an alert will be sent to the owner's smart device. A High Definition Wide-Angle View provides 720p high definition that removes the need to continually pan and tilt the camera. 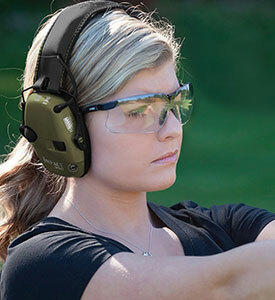 Night Vision Mode and Two-Way Audio increases versatility tenfold as owners will have access to increased visual settings and a means of communicating with other members within the household. The Honeywell Lyric C1 Indoor Wi-Fi Security Camera utilizes the Lyric App that provides 24/7 live video mode and smart mobile alerts. 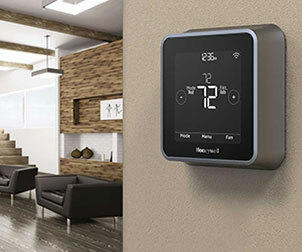 The addition of Adjustable Alert Zones will allow owners to monitor especially sensitive areas within the home. This feature bolsters vision capacity by ignoring background motion such as ceiling fans. This Honeywell Wi-Fi Security Camera also includes Cloud and SD Storage. A secure cloud storage streams and downloads clips from the past 25 hours, while the encrypted 8GB SD card provides backup in the event of a Wi-Fi outage. Self-installed and self-monitored, the Honeywell Lyric C1 Indoor Wi-Fi Security Camera is an incredibly versatile and proficient solution for overseeing any number of indoor locations within the household setting. ATMEL encryption chip on HON hardware protects data if camera is stolen AES 256 end to end encryption v/s competition at AES 128. Q: How do I upgrade my Lyric C1 or C2 Wi-Fi Security Camera to professional monitoring? Will these cameras work with a full home security solution? A: While Lyric C1 and C2 cameras are meant for self-monitoring, they can also work with a full home security solution. Q: How do I upgrade to 7-day or 30-day storage? A: All cameras currently come with free one-day storage. The 7-day and 30-day storage plans will be available in the future. Q: Can I connect my camera to a computer to download the events recorded? A: No. The cameras are encrypted end to end. Using open ports to connect to a desktop computer can create a security risk. Q: My live stream for my Lyric C1 Wi-Fi Securty Camera isn't working. It keeps spinning and won't stream. What should I do? A: Please try turning off the power to your camera, then wait 15 seconds, and power it back on again. This should resolve the issue. Q: Can I use other storage devices or software to save video clips from my Lyric C1 or C2 Wi-Fi Security Camera? A: The Lyric C1 and C2 Wi-Fi Security Cameras are not compatible with other storage devices or software. Access is limited to protect your video clips and information. To store your video clips, you will need to download them to your smart devices via the Lyric app. Your camera includes free 24-hour storage in the Cloud and comes with an 8GB SD card that's used for temporary storage if your camera goes offline. Q: What is the minimum distance required by the Lyric C1 and C2 cameras for smoke alarm or carbon monoxide detection? A: It depends on where you'd like to install your Lyric camera and the distance to the smoke alarm. Intelligent Sound Detection has been tested to work if the distance between the Lyric C1 or C2 camera and the smoke/carbon monoxide detector is within 30 feet (10 meters), even if the camera is in a different room. Q: I received a notice that my Lyric C1 camera is unavailable even though my camera is plugged in, the LED is green, and my Wi-Fi is working. What does this mean? A: The reporting path to the Internet is currently experiencing a delay longer than designed. In most cases, this issue will resolve itself shortly. Your camera is continuing to monitor and record requested sound and motion events and it will transmit them when the network is up and running again. However, the live-stream feature may not be available. In most cases, this issue will resolve itself in less than 30 minutes. If it continues, contact Honeywell Support at 1-800-633-3991. Q: At what level should I set the audio sensitivity on my Lyric C1 camera for successful smoke alarm detection? A: If your camera is installed at a reasonable distance (approximately 10 meters or 32.8 feet) from the smoke alarm, you can keep the setting at normal sensitivity. The camera is able to detect the sound even 15 meters (49 feet) away from its source at normal sensitivity. Q: Once the Lyric C1 camera detects an alarm sound or suspicious motion, how long will it take to create recorded video? A: The recording starts almost immediately. It could take up to 30 seconds for the clips to be available to view through your Lyric app. Q: I received an email that my Lyric C1 camera is unavailable. What do I need to do? A: Check the color of the LED light on the front of the camera. If it's green, then the reporting path to the Internet is currently experiencing a delay longer than designed. Your camera will continue to monitor and record requested sound and motion events and it will transmit them when the network is up and running again. However, the live-stream feature may not be available. In most cases, this issue will resolve itself in less than 30 minutes. If the LED is red, it may need to be reconnected to your router. Unplug the camera's power outlet, wait for around 30 seconds and then power the camera back on. Do the same with your Wi-Fi router. If you're still experiencing problems, please contact Honeywell Support at 1-800-633-3991. Q: How do I receive the alert/notification of a smoke alarm from my Lyric C1 camera? A: Once the alarm is detected, the "smoke alarm detected from CAM at your home/office" alert is sent to you through the Lyric app. You can also register an email address to receive notifications. Q: Once the Lyric C1 camera has detected a smoke alarm at my home/office, how quickly will I be notified? A: Upon detection of the alarm sound, the camera will send the notification immediately. It normally takes up to 30 seconds for the email and push notifications to be sent to you. Q: How long can I live stream from the Lyric C1 Wi-Fi Security Cameras? A: There's no streaming limit if you want to see what's happening in your home. Each live stream session is 90 seconds long, after which you can re-establish a connection and start another session for 90 seconds, and so on. The connection session time limit is designed to conserve bandwidth.